Essex Aviation Group, Inc., recently completed another successful project, representing their client through the process of obtaining helicopter and aircraft transportation services. The client is a Northeast-based high net worth family office who was introduced to Essex by another advisory firm the family office utilizes. From the beginning of the selection process, Essex assisted the client by identifying and evaluating various operators capable of satisfying the family’s unique helicopter transportation requirements. The process included identifying and evaluating several alternative program structures provided by multiple helicopter operators in order to select which provider would align with their defined transportation needs most effectively, efficiently and favorably. In the end, Essex successfully represented the client in the negotiations and final agreement with Associated Air Group (AAG). For more than 20 years, AAG has been providing executive travel for, helicopter and fixed wing charter flights, as well as fractional ownership programs, aircraft management and helicopter maintenance services at their Teterboro, NJ, Wappingers Falls, N.Y., Providence, R.I., and Philadelphia. PA., locations. With the Northeast’s largest fleet of S-76 aircraft, AAG is the only executive helicopter company to operate its own FAA Part 145 maintenance facility and is a Sikorsky Authorized Customer Support Center www.flyaag.com. Additionally, Essex assisted the client by evaluating the various options available to meet the family’s annual aircraft transportation requirements. 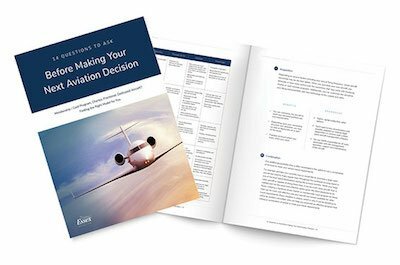 The process included identifying and evaluating various proposals from flight service providers and arrangers in order to select which would align most effectively with their defined transportation needs. Essex subsequently represented the client in the negotiations and final agreement with VistaJet US who has been appointed to arrange flight services as an agent for the family office, including the new Global aircraft flight solutions program in the United States, which began operations in March 2014. VistaJet owns, operates and provides access to the largest privately owned Bombardier business aircraft fleet – of over 40 aircraft – the majority of which are large cabin, long-range Bombardier Global and Challengers. Renowned for its consistency around the globe and as the only provider to offer an identical cabin design throughout the fleet, VistaJet’s global strategy of connecting its customers to every corner of the world with point-to-point coverage has made it the clear market leader with unparalleled experience flying into, and out of, the hardest-to-reach destinations. News and information are available at www.vistajet.com. VistaJet US Inc. will not act as a direct or indirect air carrier within the U.S., but solely as agent for its customers to arrange flights on aircraft operated by Jet Aviation Flight Services, Inc., a licensed U.S. direct air carrier or other licensed U.S. direct air carriers. Jet Aviation Flight Services, Inc. will maintain full operational control of all flights arranged by VistaJet US Inc. on behalf of its customers. Essex Aviation Group, Inc. was founded in 2013 with the primary goal of providing clients with the most current industry knowledge and experience, a vital component in evaluating the many options available to meet their business and private aviation transportation needs. Essex has experience advising and representing clients in a wide range of services, including: new or pre-owned aircraft acquisitions, new aircraft completion management, pre-owned aircraft refurbishment and upgrade management, block and ad hoc charter services and more. Lee Rohde, President, Essex Aviation Group, Inc., was recently quoted in two articles featured in the October 2014 issue of the Robb Report.